A couple of weeks ago I finally attended the long waited DevOps FastTrack Airlift 2017. 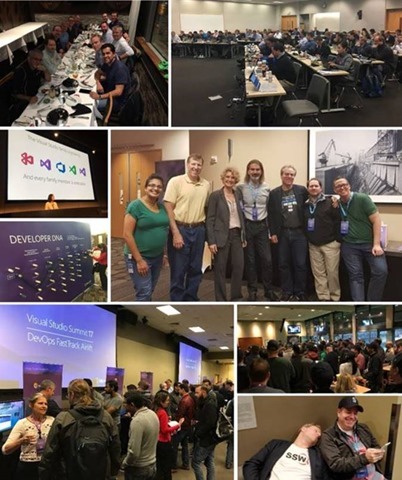 These four days were packed on advanced information of how Microsoft’s VSTS team does DevOps. The team is comprised of about 800 people, and they work on both TFS and VSTS (I learned that only about 8% of the code is different between them, pretty much the same product to me). What is great about this internal usage (known at Microsoft as “eating your own dog food”) when added to the ten thousand people that use it for Windows development, and other several thousands for Exchange, Office, etc, is that is allows for testing it at a scale that cannot be matched by any other development tool provider. For instance, even if Atlassian has (last I heard) about 600 developers, which is in the same order of magnitude of the VSTS team, they can’t beat having 40 thousand developers using the “beta” versions and having to do their daily work on the most recent bits. Microsoft VSTS is primed for scalability from the very core of its engineering process, and it shows. If you are looking at similar tools for your enterprise, I recommend looking closely not only at their scalability numbers, but also their track record for support escalation. Some tool vendors will have issues, clearly visible to the public, that had been opened more than 6 years ago and have made no progress to resolution. This is not necessarily wrong but it does indicate whether the tool provider actually has enterprise customers as their priority. With Microsoft VSTS you are also engaging with a clear incident escalation path that leads no doubts to resolution time: it is days, not months, and definitely not years, and if something can’t be resolved it will be marked as such, not be left open. Several customers have been migrating to TFS from competing tools and are amazed at how their support load just decreases, from having to be working on every weekend to put out fires caused by load on build or issue tracking systems, to just having no issue at all and getting their weekend back. With VSTS it goes even further, as now the administrators don’t have to worry about patching, upgrading etc. I am happy to oblige, given the high quality of the content. I will be using the materials at customers starting immediately as a way to show a possible ideal implementation of a cutting edge DevOps practice. Not that we need to replicate exactly what Microsoft is doing – not many companies have the same resources, in the topic DevOps, Microsoft is at the level of Amazon, Netflix, Facebook or Google – but we can always look at their experience to extract ideas of where to direct our efforts, since Microsoft is using the same tools as we are. 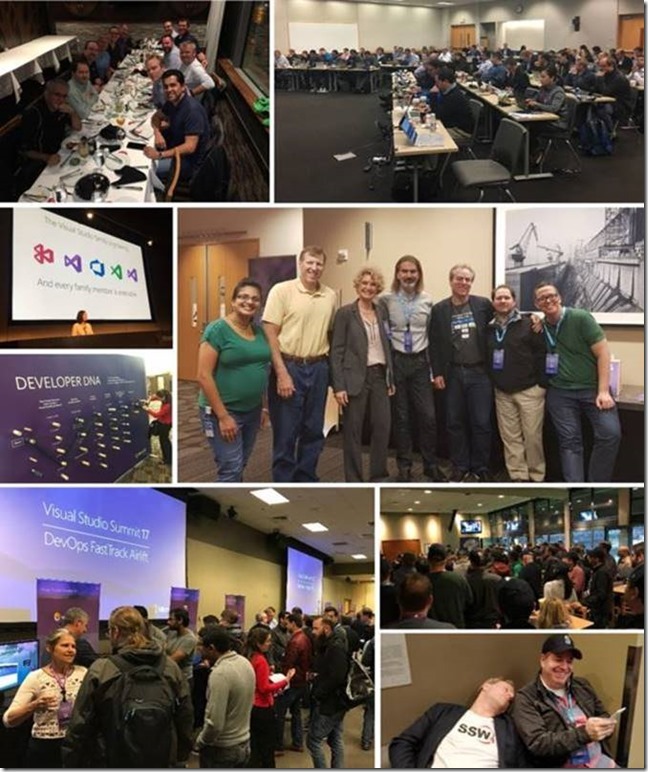 I just discovered that as part of Nebbia, a Microsoft DevOps Partner, that I will be attending an advanced training for those delivering the engagements related to the now called Enterprise DevOps Accelerator offering. As you might recall from a previous post, I had been yearning to learn more about the cutting edge of what is going on in this space. I have been working with topics that are under the DevOps umbrella since 2005, even if the moniker, and a general agreement on what it stands for, has been defined only more recently. The buzz around DevOps is indisputable, so much that has led some like Matthew Kern to declare that Agile is dead, and DevOps is its replacement. I don’t know exactly what the training will be, but I look forward to it as I can also personally see the commoditization of Agile concepts, and the rise of Scaling Agile and DevOps as its natural replacements. I will come back to that on some other post. “The Enterprise DevOps Accelerator is a limited-time offer for teams of 50 developers or more looking to modernize their application development infrastructure while managing costs. You can see the form you need to fill at the offer site. At my work we have been doing this: on-boarding teams to a DevOps platform using the tools for the job, but one per week. From my observation that is too fast, given that some of the troubleshooting that adapting existing builds and pipelines to new systems require. Two weeks is better, but even that might not be enough. It is possible however to identify a pilot project that would showcase the new practices into your organization. This is definitely a Microsoft offering I would have fun delivering. It is that time of the year where we do some planning on what is coming up in our meetings. I will be leading a Lean Coffee session later this month to go over topics of your interest when scaling Agile, then create a backlog to define what we would like to see in future sessions. Please register at https://www.meetup.com/AgileAustin/events/236835196/ so we can establish a count for food and drinks. If you ever need to compare GitFlow with GitHub flow, the article by William Buchwalter is one of the best I have found, coming from a practitioner who has lived through it. His article can be found at Git Workflow for Continuous Delivery. I have long seen GitFlow as an easy way to adopt git when coming from more traditional, centralized workflow, but not a panacea. As a matter of fact, it always reminded me of the traditional Feature Isolation that ALM Rangers (myself included) used to recommend. However, as you move delivery times faster and faster, there is a need to push it all to production even when feature is still under development. Enter then the combination of very lightweight branching (just saying, from just main) with feature toggles. For fast track software development teams that can invest on all the extra instrumentation deriving from Continuous Delivery, this branching model/feature toggle usage is becoming the norm. The Rangers have delivered a sample data tool around March. Now they have put it to work and created a sample data set based on SAFe. It makes it a lot easier to demo features and processes when applying the framework as well as being a learning tool on how to structure your SAFe project. I will be studying these two Ranger contributions on how to also make it work with Scaled Professional Scrum. Stay tuned.